There were some talented women that helped make Cohen's birthday party amazing. These ladies submitted their items for review in exchange for a spot on this post. I wanted to do a little more than a normal review, I wanted to introduce them to you. They are moms just like us that have turned their craft into a business. Take a minute to read their interviews and go support them by buying from their shops! These ladies were all great to work with and I highly recommend all of them! First let's start with these awesome invitations made by Jenny. 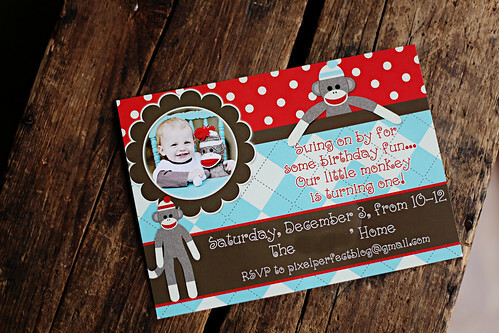 I loved that all the colors on the invitation went with the entire party's color scheme. Check out her shop Inky Pinky Paperie and you can also catch her on facebook. 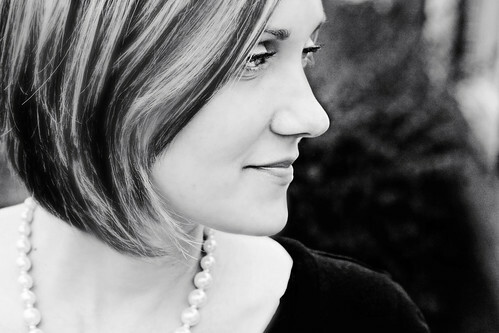 My name is Jenny Old and I am the designer behind Inky Pinky Paperie. I work full-time as an elementary computer lab teacher. I enjoy expressing my creativity through my invitation and card designs and party accessories. I am a single mother to a handsome little boy named Ashtyn who just turned 4. How long have you been an etsy vendor? I opened an etsy store several years ago but never did anything with it until the beginning of 2011. I started placing bids on etsy's Alchemy (which I miss terribly) and sold some on Facebook. I placed my designs on etsy in around March of this year and have been busy ever since. What is the inspiration for your craft? 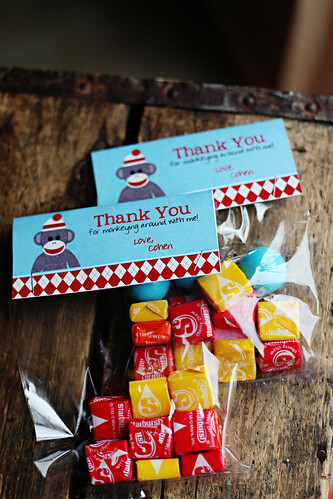 I love planning parties and I think the invitation can be the inspiration for the whole party. I always like to design tablescapes in my head that would go along with my invitation designs and party accessories. What are the products you offer in your shop? 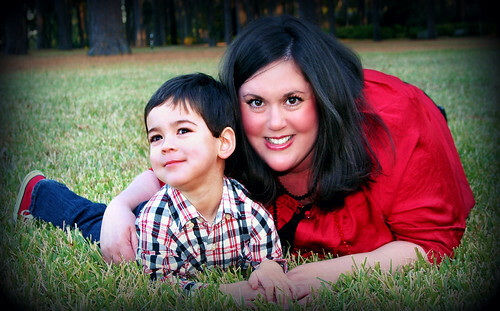 How do you balance family life and owning a business? It's not easy! Being a full-time teacher, an etsy seller, and a single mom is enough, but I'm also pursuing a Master's degree. Somehow it just all works :) I LOVE being an etsy seller so I make sure I have time for that! What is some advice you would give someone wanting to start their own etsy shop? Just do it! Take some time to perfect your craft first. Start a Facebook page, become involved in groups if you can [I am a member of etsykids!] and take part in giveaways. Do what you can to get your name and your craft out there! My Name is Faviola and I’m married to an awesome guy and have an eight y/o son, Diego. I’m a scientist by profession, who got laid off on 2008, clearly a bad time to get another job, so I beg my husband for a sewing machine that he gave me on Christmas. Since then, I think I have been sewing almost every single day. I opened my etsy shop on July 2010, but business really picked up January of this year. Every single item that I make I would use it for my own baby (the day God decides to send me another one). I love babies and sometimes make me sad that I didn’t try to sew anything for my son when he was a baby. Although, the majority of my products are direct to women with babies and children, I also have small cosmetic bags. I have wipes cases, diaper holders, changing pads, burps cloths, bibs and crayon rolls. Balancing family and work when you have your business in your home is extremely hard. You ended up working more than if you work for someone else, but at least I can work in my pajamas. I TRY to sew when my son is at school, and to not answer any emails or sew anything on Sundays. Suddenly my husband understood that if he doesn’t do the dishes, we probably have to eat with disposable plates. He also learned recently to fold laundry, so you get the picture. I have wonderful people in my family that supports me. I’m in no way an expert on this business because I’m just starting, but here are things that might help. First, you need to be patient; I made my first sale almost six months after I opened the store. It gets frustrating, but if you have a good product you will sell it. Don’t buy a lot of material until you test how it will sell. Buy a little bit and if it sells fine, then go ahead and make the big investment. Also, have good communication with your customers. I always try to send pictures along the way when I’m making customs order. Don’t take neutral or negative reviews personal. Try to contact your customer and resolve the problem. Good customer service is a MUST. 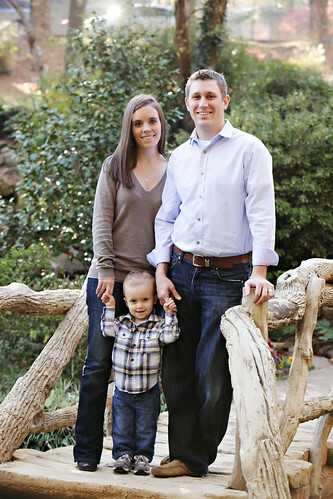 Christin is the owner of Memorable Moments Studio. You can print her items at home using your own printer but we decided to print our oder at Kinko's. The women at Kinko's were going crazy over the cuteness of everything. I loved how it all turned out. 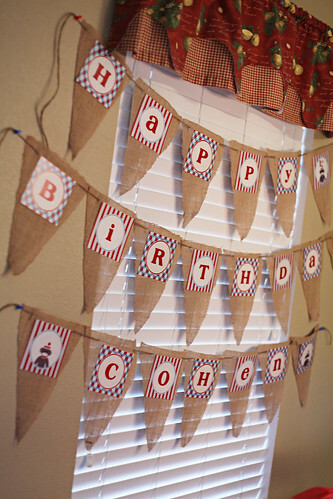 For the banner we ended up making a pennant banner out of burlap and gluing the banner printable directly on it. It was so cute! My husband, Brandon, and I met in college at the University of Arkansas. We have the sweetest baby boy, Landon. Landon turned 2 on December 1st, and he's so full of energy! He's a such a fun stage, learning new things every day. We currently live in Conway, Arkansas. I opened my store on Etsy in April 2011. I started out with a few invitations, and it has grown to over 225+ items, including Christmas cards, invitation and printable party items. My inspiration comes from my customers or from an idea I have for my personal events/parties. Most of the items in my shop have been created based on the needs of my customers, including new product lines and party themes. In my etsy shop, I offer printable Christmas cards, printable invitations and printable party items. 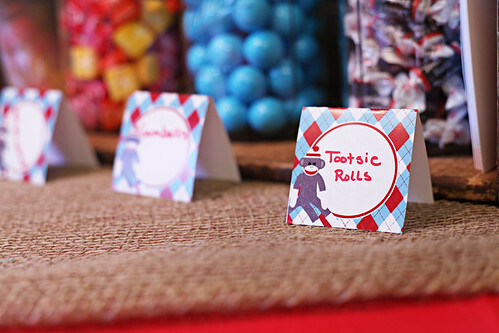 Some of the printable party items include banners, cupcake toppers, cupcake wrappers, water bottle labels, juice box labels, hershey kiss candy stickers, mini candy bar wrappers, candy bag labels, party favor tags, party signs, candy jar signs, placeholders or food tents, bubble labels, thank you notes, and gift tags. I work full-time, and Memorable Moments Studio is my side business. No matter what, family always comes first though! I try to stay caught up on orders, so it doesn't take too much time away from my family in the evenings, but I usually catch up on my orders after my son goes to bed. I also limit the number of custom orders I can take in a week, because those are the time consuming orders, which keeps the work load easily manageable. Don't be afraid to give it a shot! It's important to be as flexible as possible. Many customers come to etsy for personalized, unique items...so it's important to keep that in mind and help your customers with new ideas and help them expand on ideas they have. The thing I love about etsy is I get to do what I enjoy, work with fun and creative people from around the world, and manage my own work load. If you need a break, you can put your shop on "vacation mode" and get away. I promised myself when I started that if it ever became too much and wasn't fun anymore, I'll stop or cutback on what's offered in the store. So far, the orders seem to come in phases. For example, it's very busy right now because of Christmas card orders, but next week may be slow, allowing me plenty of time to enjoy more family time. We opened our etsy shop about 4 years ago when my husband went back to college. I would sit at our kitchen table, call my mom on the phone, and ask her how to sew different items. 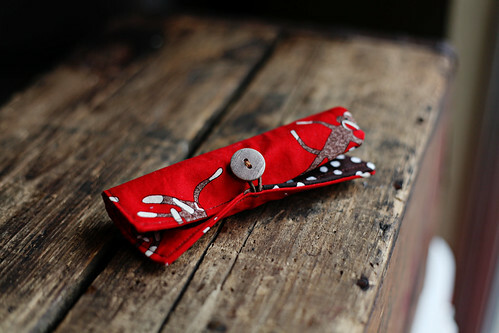 I had no idea how to sew when I began Dainty Couture! My family is the biggest inspiration for my etsy shop. I love my kiddos more than anything and cherish our sweet memories. I make party hats for them every year! It's a big event during birthday time as each kid goes through my fabric stash and develops their own creation. Some of their designs even make their way to my etsy shop! 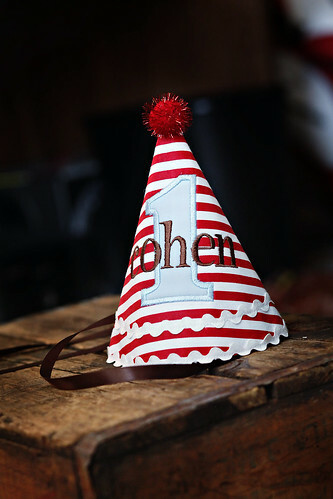 It is always fun when my nieces and nephews make a special request for a party hat as well. 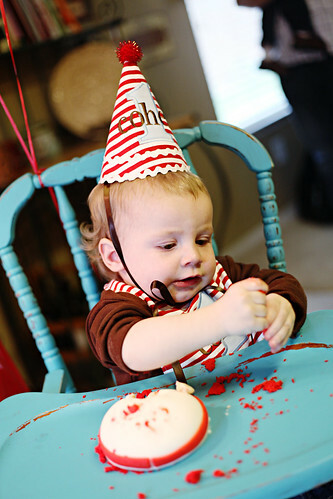 Birthday hats and bibs are the main items we make at Dainty Couture. We've sold everything from burp cloths, baby bedding, hair bows, and tutorials in the past but decided to make and sell what we love to make the most. I think this is the trickiest part of having a business. Providing for our family is certainly a priority but ensuring that I am not taking away from my time with my children is just as important. Time management and organization has become my new best friend. However, I've also discovered the involving them in what I do has proven to be an amazing thing! They learn little things here and there as they watch me sew. I let them help and develop new skills that are age appropriate. They explore their own creativity and like to use ric rac to decorate their rooms, ribbons to take their stuffed animals for walks, and use fabric for baby blankets and capes. My older two already know that Fabri-Tac is a wonderful thing and can fix just about anything that breaks! I recently found an ornament loaded with glue put back together quite well on the Christmas tree! The business has proven to be a wonderful resource to provide for our family, bond, and create memories. I couldn't ask for a better job! A lot of friends ask me this very same question. I don't even know where to start! I don't think I have all the answers but I do wish that all the things I've learned on the way were in a manual that you download when you open your etsy shop! A lot of people think they aren't creative enough to make things and sell them online. I disagree! You just need to find an item that you see every day and figure out how to make it cuter or more unique or just different. I think the most important thing I've learned while creating my shop is that family always comes first. If I plan my day around my family and then figure out where to squeeze in my sewing, it always works out. Charissa and MiMi Smith (as she is called in the shop) are a dynamic duo with incredible talent when it comes to their craft. Their shop is call MiMi's Babies. 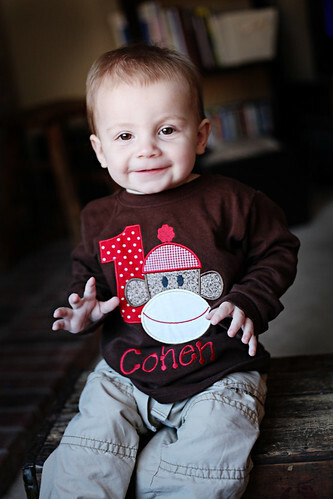 Cohen's shirt was perfect. The quality is something that will last for years. Which is important, seeing how this will now become a keepsake for him. I thoroughly enjoyed her craft and her heart. In our email conversations back and forth you can tell she is a woman who loves the Lord. First and foremost, I am a Christian, saved by the Grace of a Loving God. Blessed beyond anything I could have ever asked or imagined. Also a Wife, Mother, and Mimi to 4 beautiful healthy little men. Married to my hubs for 37 years now we have 3 children, two children-in-law, 4 grandchildren and another on the way, (all boys btw)! I love my boys! 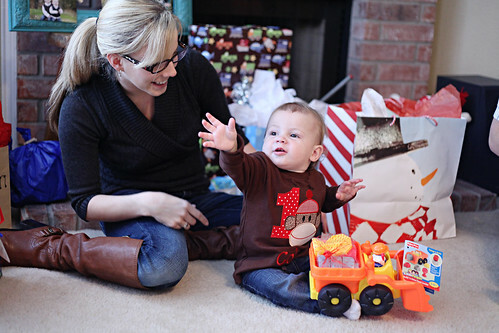 Charissa, my daughter-in-law, and I started our etsy shop in September of 2009. I had prayed for quite some time, asking God to show me how I could bring in some extra income and yet be able to be at home for my family. I wanted to feel like I was contributing to the household with the children grown, but still longed to be at home. Etsy was the perfect fit for both Charissa and myself. I believe it was an answer to prayer! When Charissa told me about it (and said she would do all the techno stuff!) I thought it would be a way to see if anyone liked what I was doing. If not, I hadn’t lost anything! Really I just love to make pretty things. I have been sewing for years. I’ve dabbled in lots of crafts over the years, but fabric is my favorite medium to work with. 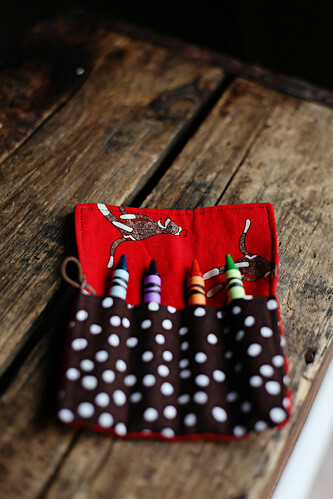 I especially love to make things for children. I’ve sold shopping cart covers locally along with diaper bags, etc., for several years before we started Mimi’s Babies. What products do you offer in your shop? I make appliquéd children’s shirts, especially Birthday Shirts. Sock Monkey is definitely my biggest seller, he’s so fun! I would love to make more children’s clothing items, but I simply don’t have the time. Birthday shirts keep me very busy! My daughter-in-law Charissa makes some amazing crochet hats, beanies, hair clips, etc. We will be making a change after the first of the year and Charissa will be moving to Hooked On Props @ Etsy It has been amazing being able to work with my daughter-in-law and she’s been very patient teaching me all I needed to know! Make sure you check out her new shop! It can be pretty tricky at times! You have to learn what you can do and what you can’t do. Occasionally you have to turn a job down to keep the stress level down. We love what we do and we love working with customers to give them exactly what they have in mind. Yes, it’s a business and we’ve worked hard to build it, but we have to remember that we can’t please everyone every time. Find something you do well, that you love to do, and do it. Do it the best you can, and market it honestly. Be fair, treat people the way you want to be treated. Take advantage of the social networking tools available, but be thoughtful about it. Know your limits, and remember what is important in life. When we stop making the things that we do, someone else will do it. But no one can take our place at home. A huge thank you to these ladies for their hard work. If you are planning a party or know someone that is send them to these shops...facebook them, pin them on pinterest, tweet about them. Help get the word out about them and support other women's entrepreneurial endeavors. You will not be disappointed with them! Thanks Monica! Looks like an amazing party, I'm sure everyone had lots of fun!! Giaonhan247 chuyên dịch vũ mua hàng mỹ với sản phẩm nổi bật là nước hoa pháp và vận chuyển ship hàng mỹ uy tín với chi tiết cách tính thuế khi mua hàng trên amazon cùng với chi tiết bảng giá gửi hàng đi mỹ giá rẻ nhất.